Ever since Ford was born 5 years ago (what?! ), I've been printing photos on photo canvases with the vision of having an entire wall in our home with canvases of our family as it grows. I envision a wall without an inch of free space because there are photos of tiny babies, family vacations, Christmas card photo shoots where behind the smiles are 10 pieces of bribed candy, and kids who are growing at an exponential rate each year. We've had our family picture taken twice in the past year, once for Christmas cards and once for our church to spotlight our adoption story, and I haven't printed out any of the pictures yet. Knowing we have Christmas card pictures in a few weeks (how is it almost October?! ), I knew it was time to order last year's canvas! I ordered two canvases from Collage.com and I can't tell you how satisfied I am with the quality! The canvases themselves are thick and sturdy, unlike some others that I've ordered elsewhere that are ridiculously flimsy. The colors are bold and bright and the picture is perfectly clear. I was shocked that the canvas came with hanging hardware already installed, I've always had to take them to a frame shop to get wires installed to hang. And let me tell you about order them for a quick second. It was easy-peasy and took me less than 5 minutes to upload my photo, choose my sizes, and complete my order. My order was to my house in less than a week! I highly recommend using Collage.com and they are constantly running killer sales! Right now everything is 50% off using the code FALL50. Here is a sneak peek at my canvas wall. 5 years down and lots more pictures to go! 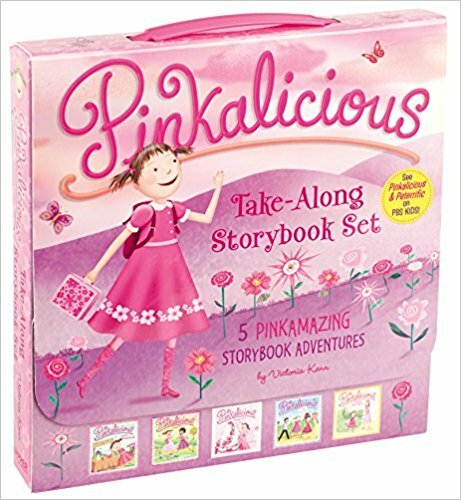 What agency are you using and why? A little bit about open adoption. I talked more about how we chose to work with Christian Adoption Consultants in my previous post, and now post adoption, I couldn't imagine walking through it without them. Susan VanSyckle was our consultant, she was amazing every step of the way. Not just her work before and during our adoption, but she has created a private group for her clients that provides the deepest and most incredible support and encouragement. Adoption doesn't end with you bringing home a baby. There are challenges and obstacles that families made only of biological children will never face. There is sadness and brokenness that comes with adoption, and walking through it with other families going through the same thing is really beautiful. Our first match was through Adoption Choices of Nevada and when that match failed (more below), we went to the top of their matching list and matched with Gideon a few days later. CAC only works with "Adoption Friendly States". You can adopt in all states but "adoption friendly" means that once birth mom relinquishes her rights 48-72 hours after birth, they are irrevocable. If you've been reading my blog for a while, you would know that we were matched with a sweet birth mama for 4 months and thought we were going to be welcoming another daughter into our family. The baby girl was born, beautiful and healthy, and mama chose to parent her. As much as it broke our hearts, we were also filled with so much joy. Baby girl would not have to experience the trauma of leaving her mama. She was never ours to begin with. We have full peace with what happened, especially knowing that this was the road that led us to Gideon, who was always meant to be our son. Gideon was known as a stork drop. 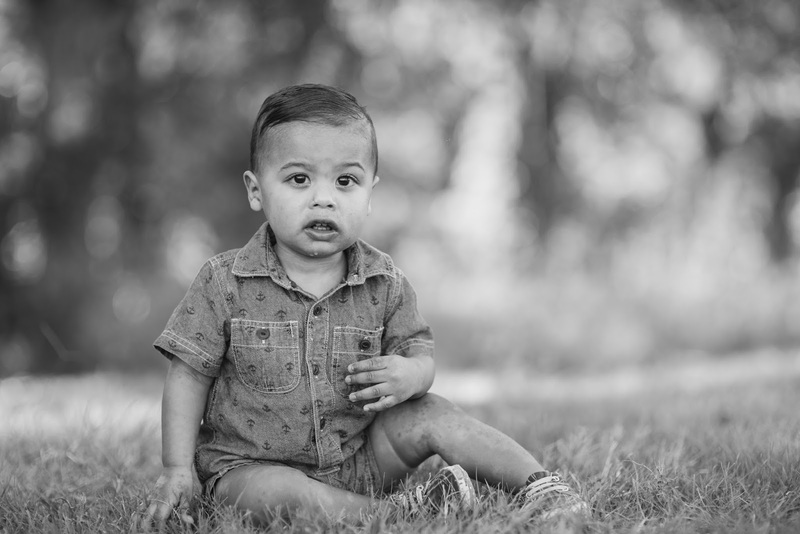 His birth mama had been working with Adoption Choices of Nevada for a few weeks before he was born but didn't have the chance to match with a family before he was born. We got the call about a baby boy born on 11/7/2016 on 11/8. He was not even 24 hours old and our social worker sent us his picture. We prayed and knew that presenting our profile book to this mama was the next step in our journey. It was only 4 days after we found out we weren't going to bringing home baby girl, but it just felt right. We laughed at the thought of having a son, bringing him home to his beautiful pink nursery upstairs. We FaceTimed with Gideon's first mama on 11/9, she chose us on 11/10, and relinquished her parental rights on 11/11. We flew to Las Vegas that evening and met our son the next day, 11/12/2016. We named Gideon and you can read about how we chose it here. Gideon's first mom named him Aaron Royal and that was listed on his original birth certificate along with her last name (more on his amended birth certificate in the finalization paragraph). When we signed placement paperwork, we had to declare what we wanted his name to be changed to. We kept his first name Aaron as his middle name. Many adoptive families use parts of the name given by the birth family or collaborate on a name. But as the adoptive family, you get to name the child whatever you'd like. His legal name post finalization is Gideon Aaron Hart and that is on his birth certificate and social security card. The most common question I get is "how much does adoption cost?". I can only speak on behalf of our adoption which was on the expensive side, but there are cheaper agencies. Private adoption is expensive and I often hear people say "it should be cheaper so more people can do it!". And that is a double edge sword because yes I wish it was more affordable so more people could adopt, but once you adopt, you realize why it is so expensive. There are so many people working day and night to care for these expectant mamas, counseling them, taking them to their appointments, holding their hands as they give birth. There are social workers, lawyers, case workers. So when it comes down to it, they are making very little money and working very long hours. Sorry I am getting off on a tangent but post adoption, I now know why adoption is so expensive and I am not angered by it. Using CAC was more expensive, but we felt God pointing us to them every step of the way. We knew He would provide for what He called us to. Our package with CAC was $2,300 and we spent another $1,500 on our home study (look at this post for more info on a home study). When we matched for the first time, the entire cost was due within 2 weeks and it was $40,000. We "lost" $16,000 in our failed match and we have full peace in that. That money is not ours to begin with. God used it to care for that mama and her family for 4 months. When we matched with Gideon, we had a balance of $24,000 in our account with Adoption Choices of Nevada and we owed another $10,000 to complete his adoption. We hired a lawyer who works directly with our agency for finalization which was $300. On top of those expenses was travel. We love flying Southwest because you can cancel/change your flights up to 30 minutes before your flight which was very helpful with adoption! Since we booked last minute to go to Vegas, flights were expensive, I think around $500 a piece one way. When you adopt out of state, legal paperwork must be filed between states (called ICPC) and you must remain in the adopting state until you are cleared, anywhere from 7-10 business days. Both of us had to be there at placement but only one of us had to stay through ICPC so we booked Jon a return flight, coming home 1.5 weeks later, and planned on me staying to wait for clearance. His flight was cheaper, but still not that cheap. I got a call a few days after Jon left and was on a plane 2 hours later. Needless to say, that was an expensive flight ($600) but well worth it! We were cleared to go home the day before Thanksgiving, praise the Lord! While in Vegas, we stayed with one of my best friend's Katie, which was absolutely amazing! It also saved us probably $2-3k of housing costs. Most people adopting in other states stay in AirBNBs or with friends when possible! I may be forgetting a few little expenses but my rough estimate is $55,000. Again, our adoption was on the expensive side. You can adopt from an agency in your state and that is often times a lot cheaper, and you don't have to pay for travel. We had our first conversation about adoption in October 2012 and started saving for it then. We didn't adopt Gideon until 4 years later and paid for our adoption in cash. Many people raise money for their adoptions through garage sales, MLM parties, t shirt sales, and more. There are also a lot of grants available to adoptive families but I don't have experience with those. Again, I truly believe God will provide for what He calls you to. This doesn't mean $50k will show up on your door step but He will make a way. Gideon's story is one that we keep within our family. It is his story to tell if and when he would like to. So questions regarding his specific first mom and why she placed him for adoption go unanswered. 70% of adoptions are open and I love how far the world has come in normalizing and removing the shame and stigma of adoption. We have a semi open adoption where we sent pictures and videos and updates to Gideon's first mama but we haven't seen her since we said goodbye in Vegas. We are praying we get to visit with her soon. Once Gideon was placed with us, we were his parents. This part gets a little bit confusing but basically we had physical custody of Gideon for the first 6 months but the agency had legal custody. He had our last name, he was covered under our insurance, he was our son. Each state has different finalization requirements but our social worker had to visit us once a month, 6 times, before finalization. Seems silly since we had already done so much work on our home study but that is the rule! We really enjoyed our meetings with her because we talked about our unique situation, how to talk to our kids about adoption as they got older, and she just got to know our family more. We also had to get medical forms filled out by his pediatrician at his well checks and submit those to our lawyer in Las Vegas. A month before we finalized, our lawyer called us with our court date, May 23rd, 2017. He stood in front of the judge in Carson City, NV with us on speaker phone and the whole thing took less than 3 minutes. But it was the most beautiful 3 minutes. Jon and I sobbed, standing in the same corner of his office we were in when we got the call about Gideon. This time, holding our son. A couple of weeks later we received Gideon's birth certificate listing us as his parents. This was very bittersweet. I know I am his mommy but I hurt for his first mom, seeing her name gone from his birth certificate. Again, there is sadness and grief that come with each part of adoption. From there, I was able to take his birth certificate to the Social Security Administration to get him a social security number. We got that in the mail when he was about 10 months old. We do not feel like our family is complete at this moment but we aren't actively looking to expand it. This may be TMI but Jon got a vasectomy 2 months before Gideon was born after we both felt clear discernment that we were done having children biologically. The Lord has placed foster care on our hearts pretty strongly in the past few months and that is most likely the next step for our family We had 3 babies in 3 years and it was hard y'all! We are really enjoying our kids ages and the dynamic of our family so we are just enjoying it. Do we want a bigger family? Yes! How will it happen? We aren't sure. We want to be faithful to where God has us and obedient to what He is calling us to. I hope this answers questions you have about adoption but if you are still left with questions, send me an email! Tomorrow our Lucy Joy turns three! Despite being smack dab in the middle of two brothers, she is all girl. 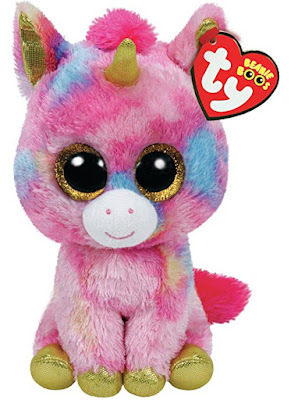 Unicorns, ponies, pink, and glitter... that is our girl. We don't do huge birthdays in our family and try to keep the gifts at a minimum but I did want to share some fun things Lucy girl is getting on her special day. Since we have grandparents on both sides and aunts and uncles who also give gifts, I try to send her top list items to family so we don't end up with a million toys. Let's face it, birthdays can overwhelming for little ones (read the Berenstain Bears book Too Much Birthday!) and they are perfectly happy with a few new toys/games/items vs 20 that they never end up playing with. Below is what Lucy will be opening up tomorrow, a mix of stuff from mom and dad and family members. 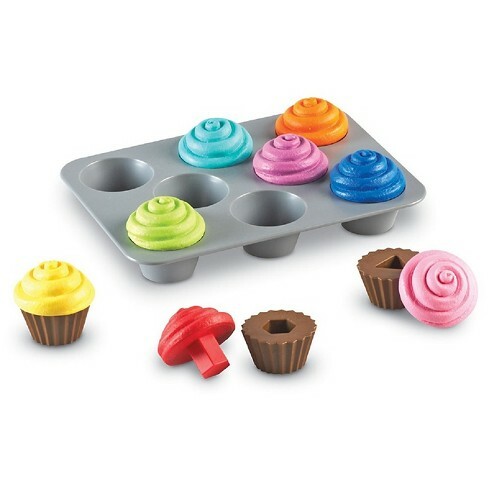 I love knowing what other kiddos are enjoying and playing with so I can get ideas! Two hand me down nightgowns (Belle and Elsa) from cousin Embry, she is going to be so excited! New Play-Doh from her Aunt Tomi.... my kids are pros at drying out PlayDoh so to have back up is great. A doll stroller from Aunt Cori....she got it 2 weeks ago and won't let it out of her sight! Real makeup....Lucy knows what's real and what's pretend and even though I know she will LOVE her Click N Play Makeup, I grabbed some real makeup brushes, eye shadow applicators, and eye shadow pallets all from the Dollar Tree. This will only be used on special occasion and I know she will be in heaven. Unicorn coloring book and smock... this came from my aunt who knows her so well! She (and Ford) have already colored in it. A talking baby doll from her Abuela....Lucy is in such a baby phase right now and often goes to bed with at least 3-4 babies. A girl can never have enough dolls! 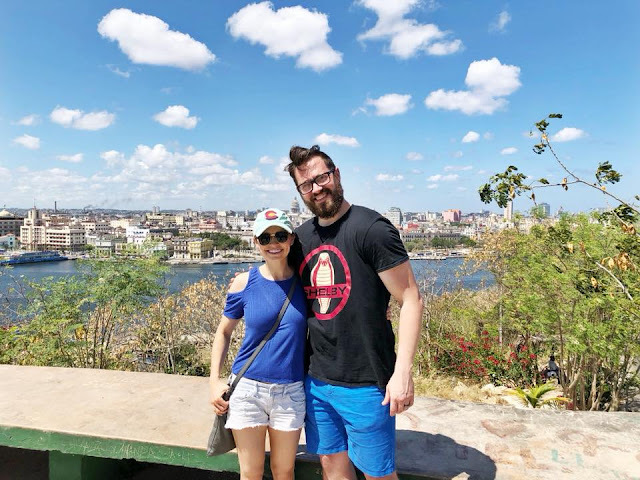 "Half Of My Heart Is In Havana...."
Jon and I traveled to Havana, Cuba last week and still can't believe how beautiful it was! We keep saying to each other that it is hard to explain to someone who hasn't been there. The architecture is intricate and beautiful, I imagine it is what parts of Europe look like. The classic cars were our favorite part of the trip. The US cut ties with Cuba in the early 60s so no new cars have been imported from the US. It kind of feels like the whole city is stuck in the 60s. No billboards, no technology, no hustle and bustle like the US. It was really like stepping back into time. There is so much poverty in the city but the people are so happy. It was very eye opening to see people living on nothing being so content, meanwhile in America we all struggle with wanting more, more, more. One of our tour guides said Cuba is 25-30 years behind in technology and it is apparent when you try to sign onto WiFi, it is basically non existent! It was incredible to unplug, relax, learn, explore, and immerse ourselves into a new culture. American travel to Cuba has been restricted until only recently after negotiations with President Obama happened. In 1961, America stopped trade with Cuba and it turned into a 50+ year issue, read more about it online, it is so interesting! Anyway, now that Americans are allowed to travel to Cuba, I wanted to jump on the opportunity (while we still can? Who knows what our president will do…). We flew Southwest Airlines- Austin to Fort Lauderdale and Fort Lauderdale to Havana which was only a 45 minute flight, gate to gate. Upon booking travel, we had to state a reason for travel since technically “tourism” is not allowed. After chatting with friends who had recently been, I wasn’t worried about not qualifying for travel. Options for reason for travel were journalism, business, family visit… a few others…and I chose journalism. I was told by friends and prompted by SWA to buy a Cuban Visa online for $50 a person. I did it 3 months ahead of time but we had the option to buy them at the gate in Fort Lauderdale. I would buy ahead of time just to be safe. A valid passport is also a requirement. It is hard to get an idea of the lay of foreign land, especially land that not many people are familiar with. I talked with friends and read lots of travel blogs (also, ladies if you love travel, join Girls Love Travel on FB! The group is amazing and so helpful. Warning, it will make you want to travel, travel, travel). We learned that the hotels in Cuba are all government owned and while they are very nice, they are expensive and it is better to support locals by staying in AirBNBs. It is very common for people to stay in the homes of locals and the locals will cook breakfast, etc. We found the most adorable private apartment on AirBNB with amazing reviews! The reviews of the apartment and hosts were what sold us! We paid $36 USD a night (which was during peak time!) for a private apartment with a king bed, AC (not common! ), tv, bathroom, mini kitchen, and living room. Here is the link for our AirBNB, I HIGHLY recommend it if you are going to visit Havana. It is in the Vedado neighborhood, right by the water, walking distance to Hotel Nacionale and so many restaurants/night clubs. We felt incredibly safe (our apartment had a gate outside the steps downstairs) and were able to get cabs immediately on the corner. The currency in Cuba is the CUC, Cuban Adjusted Peso. They also have another currency for locals called the CUP but it is not worth much so when you exchange your money, be sure you are getting CUC. After doing extensive reading on visiting Cuba and talking to friends who have been, we learned that the Euro has a better exchange rate to the CUC versus the USD. In fact, there is a high penalty rate for exchanging USD in Cuba and when you are on vacation spending quite a bit of money, you want to save as much as possible. Credit cards don’t work in Cuba so you must travel with enough cash to last you for the whole trip, that was a little nerve racking! I went into Wells Fargo (my bank), 2 weeks before our trip to order EUROS. Again, after researching and talking to friends, I didn’t want to run the risk of running out of cash on our trip so I ordered $1500 USD worth of EUROs. They do keep some at the bank but had to make an order for me which took a few days. Our AirBNB host picked us up from the airport and we were able to exchange right in the airport. We only exchanged about 2/3 of our money the first day, you are able to exchange currencies at most of the big hotels and banks. I made sure we always had small bills/coins for short taxi rides and tips. Jon has a Southwest Companion pass so I fly for free with him anywhere (cha-ching). We booked his ticket with points so I am not sure how much tickets cost but you could easily check Southwest.com or your favorite airline (we saw United and JetBlue flights there, not sure who else flies there). We paid for our AirBNB ahead of time with my credit card, which was only $130 USD for 3 nights! 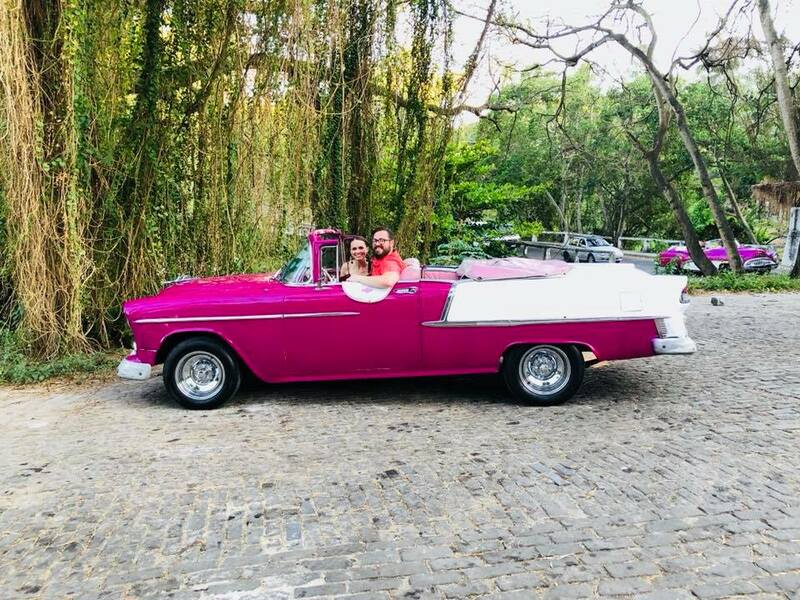 We also paid for a 3 hour classic car tour of Havana ($90 USD) through AirBNB ahead of time… I had no idea you could book experiences on their website, it was so cool! At the end of our trip, we exchanged the CUC we had left for Euros and then the day after we got home I went back to Wells Fargo to get USD and I got $465 back (we brought $1500). Everything is pretty darn cheap in Havana… we had sit down breakfasts for $7 USD, fancy seafood dinners with cocktails and lobster for $30 USD, and souvenirs for all the kids for less than $10 USD. Seeing all of the poverty in the country and learning how little the locals live on, we made it a point to tip really well during our trip. 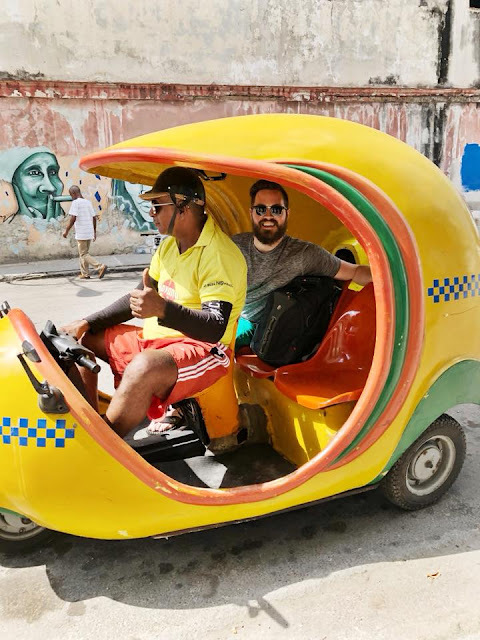 We also splurged and hired a driver each night for a drive around the city which was our favorite part but if you wanted to do Havana on the cheap, unnecessary. We spent $200 on cigars and rum as gifts too. As cheap as everything was, the most expensive thing we bought was a beach towel! We only had two small bath towels at our apartment and didn’t want to bring those to the beach so we bought one at the souvenir market. Only 2 booths out of probably 100 had them and we talked them down to $25 which was a lot considering the beach towels we have at home were $7.99 at Target! We also spent $80 to go Cabaret Parisien at Hotel Nacionale (more on that later). It was nice to be able to put money directly into people’s pockets buying things off of the street. I exchanged our remaining CUC to Euros at the airport and then Euros to USD at our bank when we got home and got back $465. 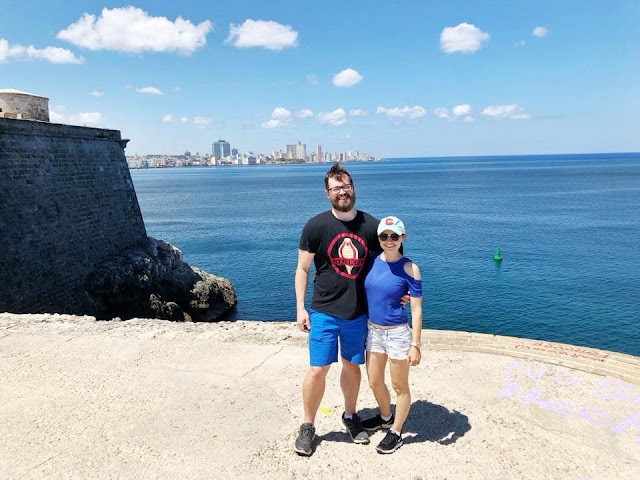 So we spent a little over $1000 in Havana, plus our AirBNB ($140), car tour ($90), and flights (not sure). You could definitely do Havana cheaper though! This was a kid free getaway for us and I am so glad we didn't bring them. We were so confused by not seeing a lot of kids when we were there... our tour guide told us most families just have 1 kid because it is so expensive. We did see kids going to school in the mornings in their cute little uniforms but for the most part we didn't see a lot of local kids or tourist kids. I would have felt perfectly safe bringing my kids to Havana but it was just not somewhere I desire to bring them... it was hot, not a lot of places had AC, the sidewalks were bumpy and uneven, I can't imagine pushing a stroller, and we were in and out of taxis and buses. It would be a lot of work with kiddos to see the city and we were so glad to be able to explore without them! 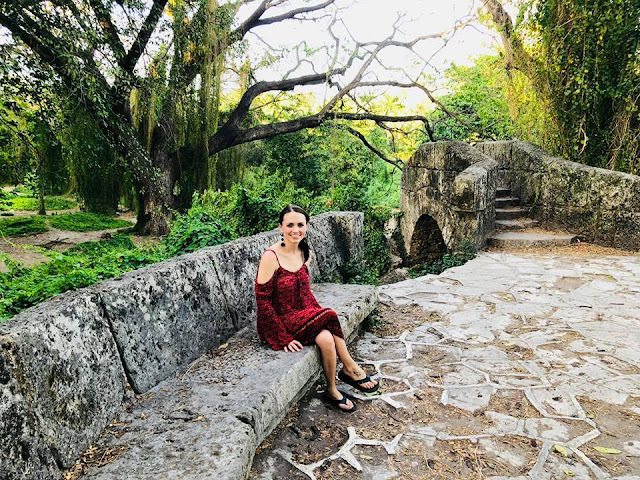 · Comfortable shoes- I packed 3 pairs of cute flip flops, 1 pair of tennis shoes, and one pair of wedges and wore my tennis shoes 90% of the time and my comfy flip flops 10%. We did lots of cabs and taxis but still a lot of walking and exploring. Comfort over style in Havana! · Sunscreen- I threw in sunscreen last minute on the morning we left and I am SO glad I did! We both got burned on the first day riding in the classic car on our tour of the city, whoops. We made sure to lather up because the sun just feels a lot hotter down there. We also went to the beach one day so sunscreen is a must. · Swimsuit/towel- if you plan on going to the beach, don’t forget your suit and a beach towel. We forgot a beach towel so ended up buying one at the souvenir market and it was pretty expensive ($25). Makes me wonder if they are just hard to find down in Cuba. · Bags- Jon brought his work backpack and I brought a crossbody purse which was perfect for our trip. It felt weird not carting around tons of baby/kid gear, I basically had an empty purse the whole time. The backpack was nice for travel (my book, ipad, headphones) and also for the beach day. · Hand sanitizer- we were warned that there isn’t much running water in public in Havana and I was shocked to find that for the most part, the places we went DID have it. A few times we were out and about without a place to wash our hands before we ate so hand sanitizer was a must. I also brought a package of baby wipes but we never ended up using those. 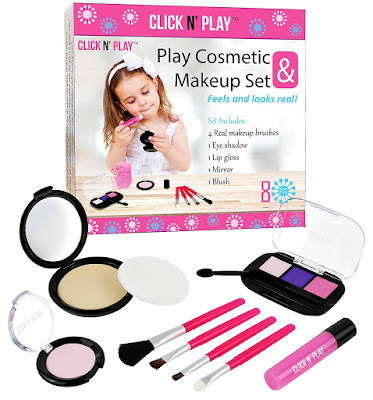 · Small package of tissues- one thing that was hard to find in public was toilet paper. Lots of places you had to pay $1 CUC to use the bathroom and then there was a lady in there selling toilet paper. Some places it was free to pee but no TP. I kept a small pack of tissues in my purse that I used for TP. · Immodium- despite being diligent with only drinking bottled water, we still experienced a touch of Montezuma’s Revenge. I think it comes with the territory of visiting a 3rd world country. Take my word for it and buy a small pack, Jon and I both used it. Also bring Ibuprofen. Long days in the sun can cause headaches and sore bodies. · Sound machine on your phone- even though we had a private apartment, it got loud with barking dogs, taxis, talking people. We have a sound machine app on our phone and put it at full blast to drown out the city noises and sleep in. 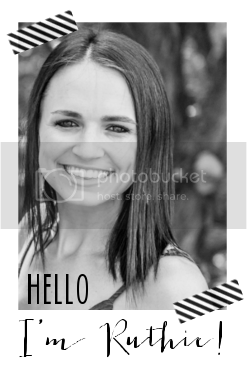 · Toiletries- I brought our own shower toiletries and I am glad I did. The AirBNB had some non-descript bottles in the shower so I was glad we came prepared. · Snacks- I packed quite a few snacks that we didn’t end up eating but it was SO nice to have protein bars, sunflower seeds, and Chex Mix in our apartment when we went back to rest in the afternoon. 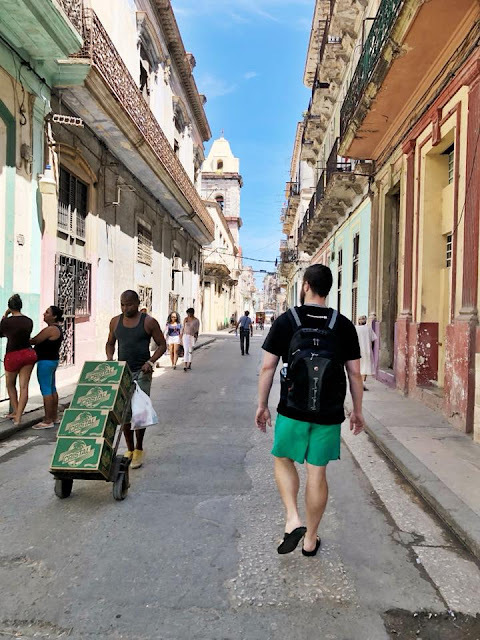 We use Trip Advisor all the time when preparing to travel and I learned something so valuable before we left for Havana. You can download the Trip Advisor City Guide for any of their cities that allows you to use it without internet! This was a LIFE SAVER!! Right when we landed in Cuba we realized we probably should have printed out a map so we could get our bearings but it was too late. I came with a list of what we wanted to do and restaurants I had researched with the addresses and how far it was from our apartment. I still have no idea how this worked but the Trip Advisor App tracked us in real time and we were able to figure out where we were and where we needed to go. This helped when trying to figure out where to eat (reading reviews), and finding our way back to our apartment. I am going to do this every time we travel, even when we are in the States! We tend to always get the notification from our cell phone carrier when we travel that we are almost out of data, whoops. I am going to be 100% honest with you and say that if you don’t have any Spanish, I wouldn’t go to Havana. The locals speak very little English and most of the restaurants we went to were all in Spanish. Jon knows pretty good Spanish (thank God!) and we still ran into some road blocks. We laughed at how funny it must look to talk to another grown adult but have a language barrier…. Lots of laughing and slow talking like we are talking to babies. If you plan on going to Havana and don’t know Spanish… start learning! “Como se dice” is “how do you say” and that is a great way to learn with a native speaker. You also want to know how to ask how much something costs, where the bathroom is, giving directions to a taxi driver, basic food words, and numbers. Jon did most of our talking to the locals and I would just say that “Mi espanol es un poquito y muy mal”…. Very limited and very bad. The only time we spoke English was to each other so coming back to the states was funny! We instinctively spoke Spanish to the flight crew, customs workers, waiters, etc. I am going to list in bullet points everything that we did with a little info on each. We packed a lot into the 2.5 days we were there. The one thing we didn’t have time for was driving to Vinales (3 hours away) to see the tobacco/coffee farms. Many people also drive to Trinidad (4 hours away) to see the sugar farms. We ran into a lot of Europeans on our trip who were in Cuba for 1-2 weeks and they would spend a few nights out in the country on the farms. Our AirBNB host offered to help us coordinate a driver to Vinales, along with tours and lodging for a night but we just didn’t have time to fit it in. 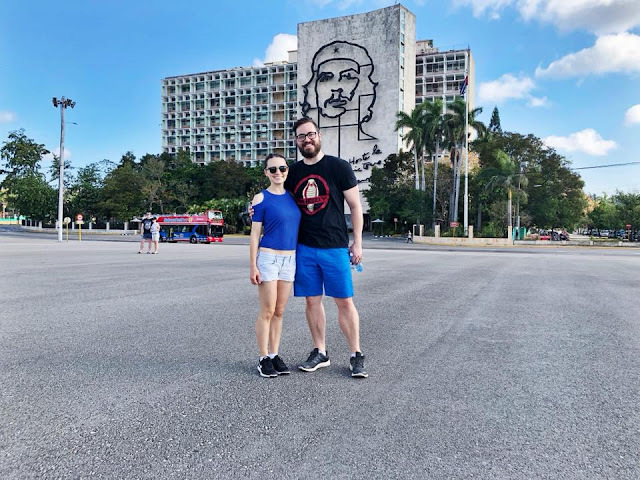 o Revolutionary Square- you will see the statue of Jose Marti and learn about Che Guevara and Camilo Cienfuegos, two huge figures in the Cuban Revolution that are still celebrated today. You may recognize Che from Rage Against the Machine prints. o Colon Cemetery (Neocropolis de Crisobal Columbus)- famous cemetery where Christopher Columbus is buried. There are thousands of beautiful grave sites. o Almendares Park/Isla Josefina- the most beautiful park we’ve ever seen! It had gorgeous banyan and willow trees with lush greenery. We saw people in all white digging and burying things, our tour guide told us about a polytheistic, voo doo religion that came from Nigeria that is now becoming popular in Cuba. It was so surreal and sad to watch these people search and attempt to sacrifice things (we saw lots of animal bones and carcasses from sacrifices) to gain power, riches, and happiness. We came back to the park a few times, it was so gorgeous. 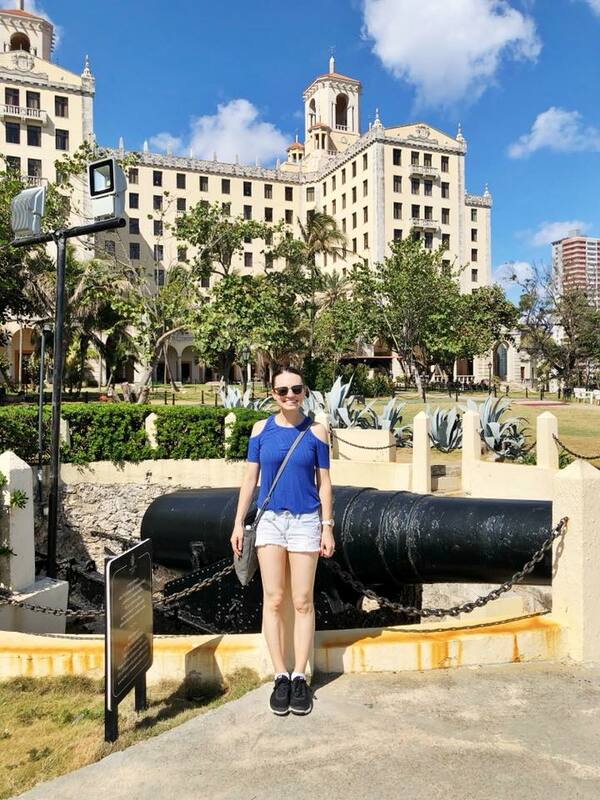 o Hotel Nacional- this is the oldest hotel in Cuba, owned by the government and right on the gulf shore. It is beautiful and immaculate and has lots of information on the Cuban Missile Crisis. We walked through the underground bunkers and learned a lot that American History does not teach. o I can’t remember the name but we went to a giant army base that was built in the 14/1500s. Each time we were in a classic car, the drivers took us there, so you won’t miss it! It has the most beautiful view of the city right on the water. 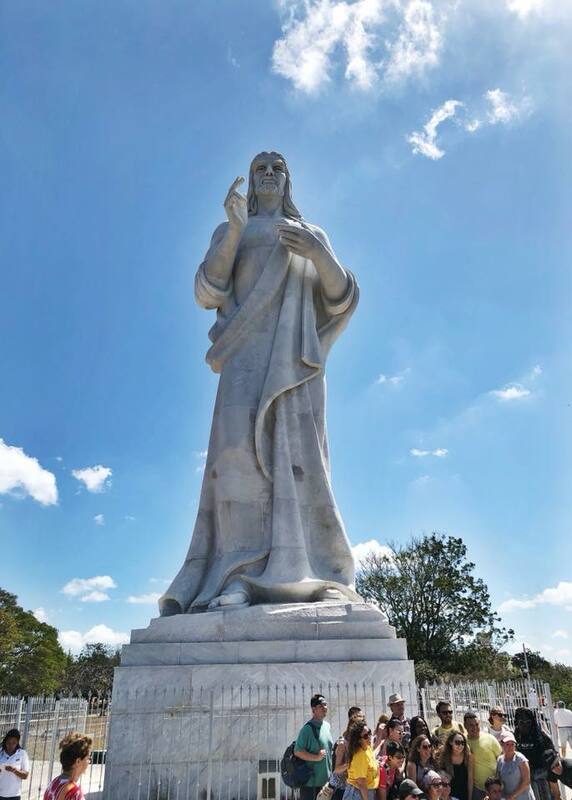 o Christ of Havana- also a beautiful view of the city from the other side of the bay. Cuban Jesus is holding a glass of rum and a Cuban cigar. o El Capitolio- this was our initial meeting place for our tour and we drove around it but it was closed for renovations. It is beautiful! o We drove through Old Havana and Central Park and learned so much about the beautiful city of Havana. 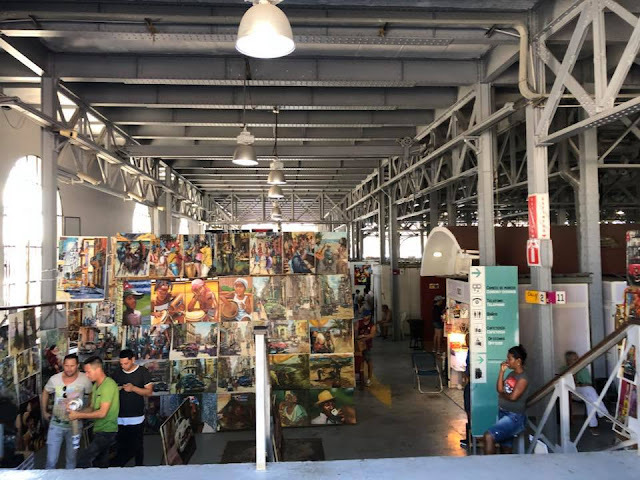 · Fábrica de Arte Cubano- this came highly recommend to us and it was amazing! It is a big old warehouse or church building that they’ve remodeled into an art gallery, exhibition hall, music venue, bar, and night club. It was $2CUC to get in and drinks were really cheap. We walked around all of the interesting art exhibits and listened to a jazz artist. We ended up in a large venue where they had a huge iMax like screen and were playing a documentary on scoring and music in Hollywood movies. It was SO COOL! We stayed from 8:30-10:30p on a Sunday night and it wasn’t too busy. I’ve heard it can get busy depending on who is playing music, etc. · Museo de la Revolucion (Museum of the Revolution)- after learning about the Cuban Missile Crisis and Cuban history from our tour guide, we knew we wanted to go to this museum. It is in a beautiful stone building (all of the architecture is so old and intricate… makes me think of Europe). It was a bit confusing because it didn’t tell you what room to go in first so we had to piece things together, and like I said above, not everything was translated into English but we loved it. We had read reviews on Trip Advisor that told us to be prepared to learn about what the US did to Cuba and be shocked because they leave those parts out of US History… and they were right. Outside they have the real cars and boats the Cubans used during the revolution and so many cool artifacts. I think it was $10 CUC per person to get in. 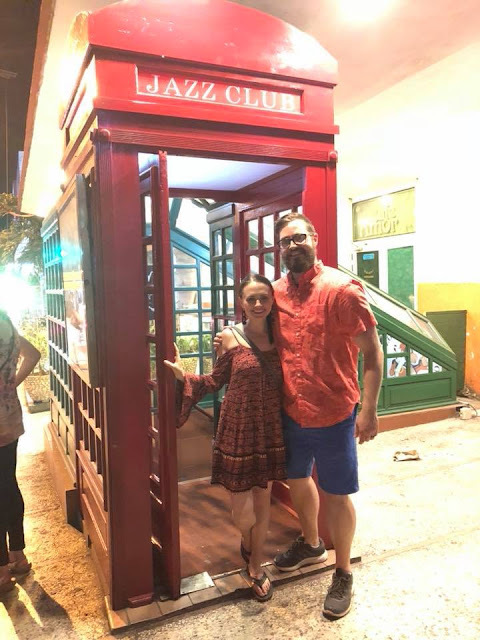 · La Zorra y el Cuervo- we read about this jazz club before coming to Cuba and we are SO glad we went! It was right around the corner from our apartment and we were told to show up early which was good because a line formed 30 minutes before doors opened. You enter through a vintage phone booth and $10CUC gets you admission and two cocktails. We got there a little before 9:30p on Monday night and were second in line. It’s a small venue so they only let a certain number of people in. Doors opened at 10p and music started at 10:20p. A world famous group played, the drummer was insane, pianist was incredible, and bassist was playing 6 strings. We overhead a guy talking who composes music for orchestras for movies in LA and he came just to listen to this group. We absolutely loved it! · Floridita- this is a famous restaurant in Cuba, known for being Ernest Hemmingways favorite bar and the birthplace of the daquiri. We went during peak lunch hour and it was insane, we didn’t even ask how long the wait was. They had a full jazz band and cocktails while you waited. We didn’t end up eating there but it was cool to see. It is right in the heart of Old Havana by Central Park. · Feria Artesanal Nave San Jose- this is a huge souvenir market we went to, it’s right by where all of the cruise ships doc. Items were so cheap and we loved browsing, buying things for our kiddos, and soaking it all in. The artwork was so beautiful, displaying the classic cars and architecture. We didn’t see any other stores where we could buy souvenirs so be sure to visit this! 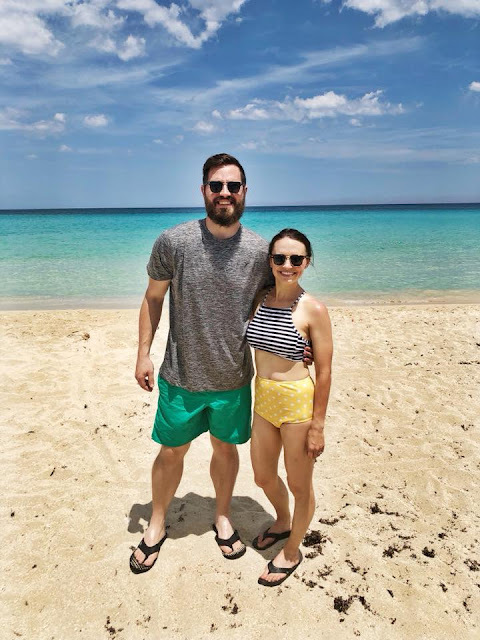 · Playa Santa Maria- I had no idea beaches were so gorgeous in Cuba but they knocked our socks off! We took an air conditioned charter bus (Transtur) to the beach 30 minutes away (pick up/drop off was Central Park). 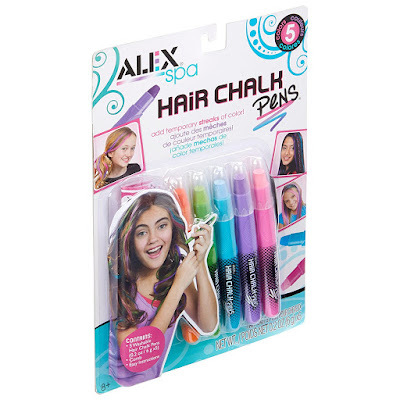 It cost $5 CUC… a steal of a deal! Cabs to the beach were $30-40CUC. There were a few stops at different beaches but our AirBNB host recommended Santa Maria and it was nice because most people stayed on the bus for the next stop so it felt more private. We weren’t sure what to expect but there were lounge chairs and umbrellas you could rent for $2 CUC each and cocktails, food, and cigars for purchase. This was one of my favorite parts of our trip….we swam then laid on our chairs in the shade just relaxing. The sun felt a lot hotter than Texas sun so bring sunscreen! The bus picked up every 40 minuets until 6pm so we stayed for 2.5 hours then hopped back on the bus, it was the perfect amount of time. · Cabaret Parisien- a few people told us about the Tropicana show in Cuba and after doing some research, it seemed expensive and over rated. We ended up finding out about the Cabaret Parisien at Hotel Nacionale and were excited that it was highly rated and more affordable ($40CUC each). We read reviews NOT to eat dinner at the show beforehand and we didn’t buy tickets until the night of at 9pm. The show is at 10pm so we were there pretty early and they seated us in the front row…. And by front row I mean I had to lean back during some of the numbers because I was about to get kicked in the face! The show was 100% in Spanish and it was wonderful! Beautiful costumes and dancing and it was such a different entertainment experience than in the US. · We also spent time exploring on our own. Walking the small streets of Old Havana, going into hotels, looking into windows, talking to locals. One thing I kept saying to Jon was the lack of signage all over the city. When I think of America, I think of Times Square with all of the advertising and lights… Havana was the opposite. You kind of had to know where you were going because stuff was unmarked. As we walked, we weren’t sure if we were in a neighborhood or residential area or more commercial. Everything was intermixed. We loved looking inside of boxing gyms and schools… the children all wear cute little uniforms. · Each night we went to Hotel Nacionale and chose a classic car we liked and paid the driver $30CUC to drive us around at sunset. It was so relaxing and fun! I am going to list all of the places we ate with a small description. I did a ton of research before we went and had a long list of restaurants to try and we didn’t go to any of them. We trusted Trip Advisor when we got there and took advice from the locals we met. We were told not to expect much from the food and I can see why but I wasn’t totally disappointed! We ate a lot of yummy seafood and ended our trip with a few Cuban meals. We definitely didn’t over eat when we were there and we were sad we didn’t get lots of treats (one of our favorite parts of traveling is finding awesome treats). I did bring a package of chocolate Pocky that we polished off when we came back to the apartment at midnight each night. I wasn’t prepared for the odd pairings of food at meals but we went with it! · Toke- this was right by our apartment and it was a great place to go our first evening. I ordered shrimp and spaghetti and that is exactly what it was. A huge pile of spaghetti with garlic and tons of grilled shrimp. Jon ordered lobster enchiladas that turned out to be a bunch of seafood in a sauce with rice and beans. It was really good and so cheap. We also went here on our last morning for breakfast. Jon got simple fried eggs and toast but I got a Cuban sandwich and it was HUGE and delicious. A few restaurants served plantain chips, I love those. 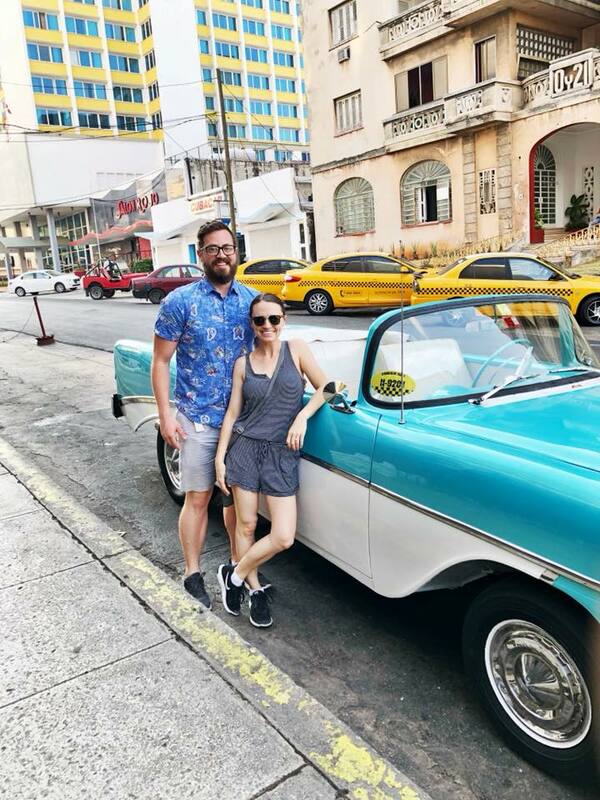 · El Biky- also right by our apartment in the Vedado area, it was very fancy but really inexpensive. We got an “Americano” breakfast…. Bacon, eggs, toast, and fruit. They have a bakery attached so we got a chocolate pastry for the road. · Elizalde- we were starving after the car tour and chose a highly rated restaurant by Central Park. This was probably my least favorite meal… it wasn’t bad but not something to write home about. I got a club sandwich and Caesar salad and Jon got some seafood paella or something? It was pretty expensive too. · Balcon del Habana- our second night we asked our driver where he recommended we go to eat and he dropped us off here and we are so glad he did! It was on the beautiful deck of a big, historic home, with an intimate atmosphere. We got a seafood platter for 2 and enjoyed lobster tail, shrimp, and white fish. They brought out flan with a candle and sang happy birthday to Jon. It was our most expensive meal $50 CUC but so delicious. · Café Nana- this was a few minutes from our apartment and we stopped in for a quick breakfast one morning. There were only a few breakfast options on the menu of each place we went to so we stuck with eggs, bacon, and toast and paid $10CUC. Lots of places also have fresh squeezed fruit juices. · Fonda La Paila- we ate dinner here on our last night and it was absolutely delicious! We were so over seafood and got excited when we stumbled upon it while walking around and read about the delicious “bbq” on Trip Advisor. We got roast chicken, filet mignon, black beans, and black rice… it was amazing! It was tucked into the side of a hill with outdoor lights and neat decorations. We took taxis most of the time. Cars are either classic cars or junky old Russian imports and we took about half and half. You definitely pay more for the classic car taxi so we did that when we wanted a relaxing ride but if we just needed to get from point A to point B, we would flag down a cheaper taxi. Always ask "Cuanto cuesta?" (how much?) before getting in. They also have these funny little motorcycle egg taxis that were the same price as a regular taxi. We took one for the experience and it was fun and windy. We had our AirBNB host pick us up from the airport and I highly recommend arranging airport transportation before you go. There is a bus system in Havana and it costs something like $.05 per ride. That may sound enticing but these monster buses were packed with 100 people at a time. Taking the bus is definitely a way you can save money during your trip but it wasn't what we wanted to do. Don't expect to be able to work during your trip to Cuba. Internet was scarce and intermittent. We bought WiFi cards and went to a park nearby to sign on (you can tell the areas with WiFi because you see a bunch of people glued to their phones). We were only able to send a few messages, load email, and FaceTime with our kiddos but no browsing or surfing the internet. I thought it would be overwhelming to be without internet but it was pretty darn awesome. It made me realize how much mindless time I waste on my phone. Jon and I talked, relaxed, napped, and just enjoyed the silence rather than filling our time on our phones. All of the hotels we went to had WiFi, but still not great connection. 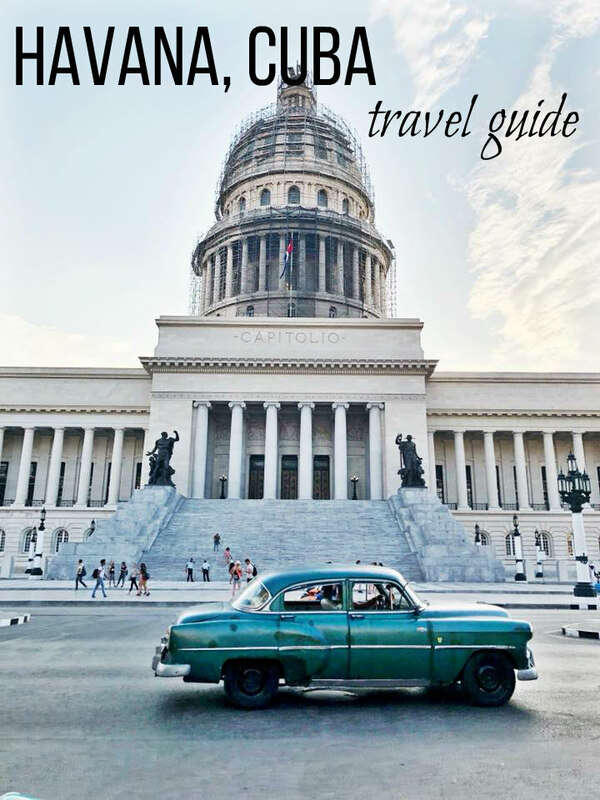 I feel like I covered it all but if you have any other questions about traveling to Havana, Cuba, send me an email! Phew. Now that I've managed to get some sleep and catch up on laundry, I can consolidate all of my thoughts after tackling Disney world with 5 kids, 5 and under. The whole time we were there I kept thinking, "I need to write this down!" or "This is going on the blog!". When people ask me how it was I have the same response.... absolutely magical and incredibly exhausting. There is NO tired like Disney tired, but there is nothing that compares to the magic and fun of Disney World. I keep trying to think of ways to organize my thoughts and tips but bear with me, I am just going to go with the flow. 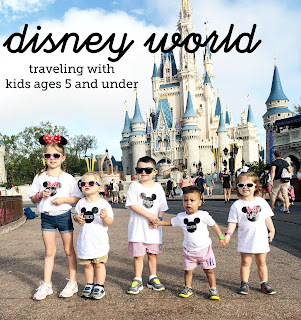 Jon and I took Ford and Lucy to Disney World 2 years ago when they were 2 and 8 months old and this trip was drastically different (in a good way). We met up with my sister, her husband, and their 2 kiddos and then my parents joined us for the last 2 days of our trip. We had SO much fun with cousins and I highly recommend doing Disney with family or friends. It also helps that we could take turns watching the kids and go on adult rides, more on that later. I am 100% Type A and have a knack for packing and organizing. 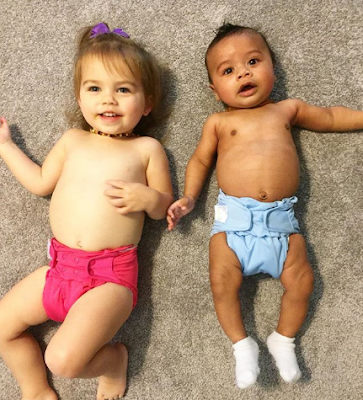 I packed the kids outfits in large Ziploc bags by day and included everything from clothing, socks, and undies. This made it SO easy to set out bags the night before as we were exhausted and crawling into bed. I packed 1-2 extra outfits for each kiddo, 3 pairs of jammies for 5 nights (and only used 2), light jackets, and ponchos. The kids each got their own mini Disney suitcase for Christmas (here and here) and we let them pack toys, games, and snacks in those for the plane. The suitcase set came with a zipper bag and that was great for bringing to the parks with snacks, autograph books, sunglasses, and little toys to play with in lines. Jon always carries his backpack when he travels with his iPad and laptop so we used that as our bag for the week, carrying snacks, diapers, wipes, etc. Don't forget sunscreen! Florida is almost always hot with lots of sun and humidity. We stayed at Disney's Caribbean Beach Resort and it was great. The resort is under some major construction but it provided all we really needed. The rooms were pretty small but clean and efficient. There are 3 tiers of Disney resorts and we chose the lowest because honestly you are never in your room during the day, only at night to sleep. The rooms are pirate themed and the kids loved that. Jon and I shared a full bed, Lucy and Ford shared a full bed, and Gideon slept in a pack and play (provided by Disney) in the bathroom. There was a big curtain between the room and bathroom which was nice. Staying on Disney property has a lot of perks, the main one being the bus system. Every 10 minutes, a bus comes through the resort going to all of the different parks. There was a delicious buffet and a food truck on the property and we ended up eating there 3 of the 5 nights. We didn't even bring our swimsuits but there were pools, slides, hot tubs, etc. 2 years ago we stayed at Disney's Swan Dolphin and it was great. It was more of a traditional hotel whereas the Caribbean Beach was more resort style but both were great. I am anxious to see Caribbean Beach once construction is complete. If you stay at a Disney property, you get free transportation to and from the airport on the Disney Magical Express. You must make your reservation in advance and is pretty streamlined once you arrive. The big downside is that it can take quite a while to get you to your hotel. 2 years ago we were the very last stop (they group you by arrival time and drive to multiple hotels) and got dropped off at midnight, ugh. This time we were the first drop off which made our ride only about 30 minutes. It is fun because they have a video looping with Disney tips and cartoons, the kids loved it. It would be a lot quicker to take an Uber but we loved that it was free and we didn't bring carseats. It wasn't worth it for me to pack 3 carseats for an Uber. They pick you up 3 hours before your scheduled flight home so keep that in mind if you are taking an early flight. I remember 2 years ago researching where I could find cheap Disney tickets but your best bet is through My Disney Experience. Children under 3 are free so we didn't have to pay for Lucy or Gideon, yay! Disney now sends you a Magic Band bracelet a few weeks before your trip and all of your ticket information, Fast Passes, hotel key, meal plan, and even credit card info (if you choose) is on there. My Disney Experience is the Disney website and app for managing your whole trip. The app is truly incredible! We used it every day we were there, looking up wait times, finding maps of each park, ordering food for mobile pickup, and changing our Fast Pass times. Fast Passes are the greatest invention of all time. You are allotted 3 per day and they give you access to the fast lane of the line, going right up to the front. Some Disney rides have 1, 2, and even 4 hour waits (Avatar at Animal Kingdom), but you can reserve your FP so you don't have to wait. Each FP gives you a 1 hour window where you can go right to the front and ride. I did a quick Google search and also asked on my mom's group the best rides to use a FP for (versus just waiting in line). I will talk about my suggestions later. If you are staying in a Disney hotel, you can reserve Fast Passes 60 days before you arrive. 30 days for non Disney hotel guests. You can change your FP selections on the My Disney Experience app as many times as you want... we did this a lot if we realized there was no wait for something we had a FP for later in the day. Also, not many people seem to know that when you use your 3rd and final FP of the day, you can grab an additional FP on the My Disney Experience App or at a FP kiosk at the park. If you have a park hopper pass (we did not), you can get it at any park. Some of the really popular rides "sell out" pretty quickly so be sure to book your FP well before your trip! We had 4 days total at the park which was a lot to do in a row but we managed and it was great! We did Magic Kingdom day 1, Hollywood Studios day 2, Animal Kingdom day 3, and back to Magic Kingdom day 4. We chose not to do Epcot after hearing a lot of it was under construction and we had plenty to do between the 3 parks we went, and we still didn't even do everything at Magic Kingdom in 2 days! We brought a single stroller (Britax B Agile) and then rented a double (City Mini Double) through Kingdom Strollers. I cannot tell you how awesome it was to rent a stroller! Ford is 4.5 and still loves to be in the stroller but I encourage parents of even 5-6 year olds who don't like a stroller to rent one. Disney is SO much walking and it is pretty much always hot. It is nice to have a place for little ones to rest. It's crazy to see such big kids passed out asleep in strollers at Disney. Kingdom Strollers had our stroller at our hotel when we showed up and it was labeled with our name (tons of people rent strollers). It came with a cup holder and rain cover which we didn't have to use but nice to have. Gideon and my 2 year old nephew napped in the strollers during the days, I recommend getting one that lays all the way back. A stroller is also a great place to store stuff... snacks, diaper bag, drinks, etc. We left the stroller at the front desk when we checked out. Disney is expensive, if you are planning a trip there you should already know that! And that includes the food. They allow you to bring as much food/drink as you want into the park so I packed an ENTIRE diaper box of snacks and checked it on the plane. I packed tons of Clif Bars, Nutrigrain Bars, fruit snacks, dried fruit, pouches, PB crackers, pretzels, and other dry goods. Our room had a mini fridge so I packed 2 quarts of almond milk (you can buy it in cartons in the dry section) for Gideon. Snacks made mornings easier because I gave each kid a bar on the bus to the parks and that would tide them over until morning snack. We ate lunch at the walk up restaurants at Disney, we decided not to do any seated dining because we had 5 kids under 5 and just wanted to go with the flow. Every restaurant will give you cups of ice water for free so I packed our kids water cups and we would refill throughout the day. We splurged on $6 Mickey pretzels and $5 Mickey ice cream sandwiches a few times but mostly ate our own snacks. With how much my kids snack, this saved us a lot of money! The My Disney Experience allows you to order food from any of the non sit down restaurants. I couldn't believe how easy it was. We'd choose our restaurant, order food on the walk over, and go pick it up right away. The lines during the lunch hour were insane so it was really nice to bypass those and get a table/food right away. There is an order tracker so you know when your order is ready and a separate counter for mobile pickup. Our little family had dinner one night at the Sci Fi Diner at Hollywood Studios and it was SO FUN! Your table is shaped like an old classic car and it is set up like a drive in movie. It is dark and cold and the kids loved watching the black and white movies and old cartoons. We made a last minute reservation on the My Disney Experience App where you can search for restaurants by park, price, or whether or not they have characters. We had originally booked a character breakfast but since we had met all of the characters multiple times, we decided to cancel and save $200. Again, Disney is expensive! One of the hot souvenirs at Disney are these little bubble wands that cost $24 a pop. My kids kept asking for them and I reminded them we had a fun bubble machine at home. If I would have known, I would have totally bought a cheap one at Target and brought with us. On every corner there are stands to buy bubble wands, Mickey ears, light up toys, etc.... for a pretty penny. I let each kiddo pack their own little toy bag so when they asked for toys, I reminded them we had a lot at home. I just hate chatchski things so we didn't buy any souvenirs. 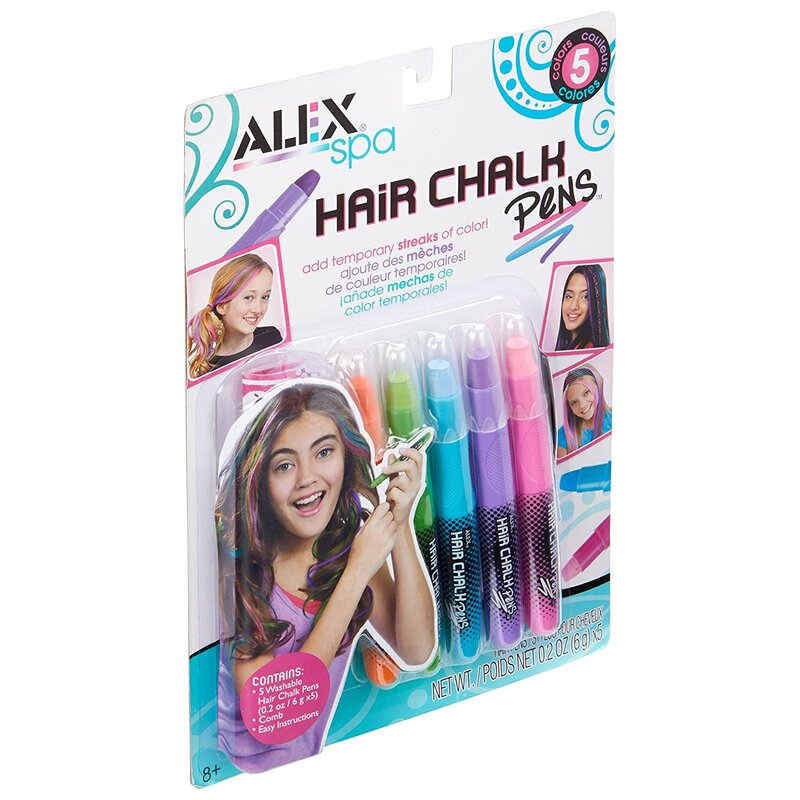 You could always buy a few things a head of time and bring them out as prizes while you're at the park. Like everything else, there is a huge mark up and things are super pricey. I am shocked that my kids never asked for these giant Mickey balloons that were on every corner! I am SO glad my girlfriend who just came to Disney with her almost 2 year old told me about this. Rider Swap allows parents with kids who aren't allowed to ride, each have a turn. How it works is when you walk up to a ride, ask for a Rider Swap. They give you a lanyard and then at another check point or the front of the line, they'll give you a Fast Pass ticket (not on your Magic Band like the other FPs) good for 3 people. They also don't expire for a few weeks! My parents met us for the last 2 days of the trip so we used the Rider Swap SO MUCH and we all got to ride some of the awesome adult rides! Example... two of us would reserve a FP for the Everest Coaster at Animal Kingdom and then go at our scheduled time and get a rider swap. We were done in 10 minutes and then the rest of the adults could use the FP immediately or come back later. My biggest piece of advice.... wear tennis shoes. Skip the cute flats or sandals because you will be left with sore feet and blisters. Wear a good pair of broken in tennis shoes the whole time. Check the weather ahead of time and pack accordingly. The weather was only in the 70s when we were there but the humidity was crazy! It felt so much hotter. Shorts/tanks and layers if it will be cold. We packed ponchos just in case because afternoon showers are pretty common. I wore a hat the whole time because I hate my face being in the sun. Pack sunglasses for yourself and your kids. Bring sunscreen! Make sure to spray those precious baby legs sitting in the stroller. It's funny that even in Disney World, sometimes kids just want to play on a playground or with a tiny toy. They can get overwhelmed with the rides/characters/shows so it is nice to have a little break time. While you are waiting in the Dumbo line, there is a huge indoor playground. Our kids just wanted to play in there and not ride the ride. It was the perfect rest time for the adults and then we were done, we walked right up to the ride. Right at the entrance of DinoLand in Animal Kingdom, there is a playground with a dinosaur bone dig. We had to pry our kiddos out of it after an hour, they were just filling buckets with sand and barely even speaking to each other! There is a little kids area at Magic Kingdom right at the exit of Splash Mountain. I was on kid duty while some adults rode the ride and the kids just chased each other and played hide and go seek. Our kids also loved the carousel right behind Cinderella's Castle at Magic Kingdom. There was hardly ever a wait. If you are a nursing mama or have a tiny babe, be sure to find the Baby Care Centers at each park! We went 2 years ago when I was still nursing Lucy and they are air conditioned buildings with private rooms for nursing/feeding/changing. They have rockers, TVs, changing tables, and you can buy anything you need for baby. My kids (and me!) hated the Bug's Life show at Animal Kingdom. Little creatures come out of the seats and poke you and they spray this gross stuff to make it smell like a stink bug. We ran out about half way and my sister said it little cockroaches came out at the end. No thanks. Lion King Festival of the Lion was incredible. I cried a few times during the songs and the costumes were amazing. Be sure to get a Fast Pass ahead of time! We absolutely loved the 3D Mickey's Philharmagic show in Magic Kingdom and did it twice! The kids were so excited and laughed the whole time and it was a nice (cool) break for the adults. The last day at Magic Kingdom we had time to kill before our last FP at Splash Mountain so we did the Bear Jamboree and the kids loved it! Again, it was a nice break for the adults too. We did quite a few shows at Hollywood Studios and they were all great! Disney Junior was perfect for our aged kids because they watch all the shows at home. There were bubbles and streamers and you got to meet the characters after for autographs and pictures. We did the Frozen show which was a sing along, and so adorable. We did the 3D Muppet show and my kids laughed and grabbed things the whole time. The last show we went to was Beauty and the Beast at Hollywood Studios and it was beautiful! My kids had never seen the movie and were hooked. I had a few tears because it reminded me of my childhood. Hollywood Studios has a lot of StarWars things and had this walk of Storm Troopers and mini show pretty much every hour on the main strip. Disney Springs is "Downtown Disney" and basically it is a strip of shopping and restaurants, free to get in to. You can take buses from your hotel or any park and it is a nice change of scenery. I was a little bummed by the lack of restaurants, especially kid friendly ones, but we ate a Blaze Pizza one night. Supposedly the Avatar ride is out of this world but even 60 days prior to our trip, there were no FP available. The line was also 4 hours long and people were saying it was worth it! No thanks. So if you have a hookup for FP, try to get one of those! I have been working on this post for a few days and trying to think of everything imaginable but I am sure I forgot stuff! If you have questions about Disney, shoot me an email! ruthiehart1@gmail.com. Overall, Disney World was exhausting, draining, expensive, and WONDERFUL! It was magical and worth it. I kept telling myself, "this trip isn't about you" because it was far from relaxing but it was incredible to see the magic through my children's eyes. They are already asking to go back... to which I am answering 5 years guys. Go with friends/family, go when your kids still believe in the magic, it is worth it!